First published in 1959 to critical acclaim and enduring popularity, a new edition of the landmark novel follows the struggle of the Monks of the Order of Saint Leibowitz to preserve the remnants of civilization after a nuclear war and to protect them against tyranny. Reprint. 15,000 first printing. Winner of the 1961 Hugo Award for Best Novel and widely considered one of the most accomplished, powerful, and enduring classics of modern speculative fiction, Walter M. Miller, Jr.'sÂ A Canticle for LeibowitzÂ is a true landmark of twentieth-century literature -- a chilling and still-provocative look at a post-apocalyptic future. In a nightmarish ruined world slowly awakening to the light after sleeping in darkness, the infant rediscoveries of science are secretly nourished by cloistered monks dedicated to the study and preservation of the relics and writings of the blessed Saint Isaac Leibowitz. From here the story spans centuries of ignorance, violence, and barbarism, viewing through a sharp, satirical eye the relentless progression of a human race damned by its inherent humanness to recelebrate its grand foibles and repeat its grievous mistakes. 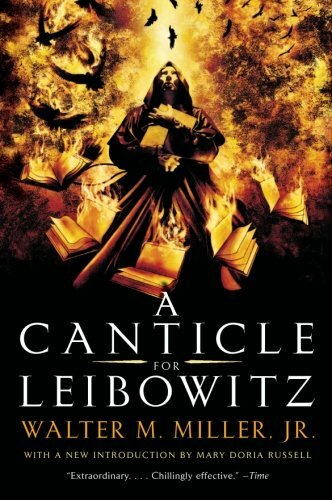 Seriously funny, stunning, and tragic, eternally fresh, imaginative, and altogether remarkable,Â A Canticle for LeibowitzÂ retains its ability to enthrall and amaze. It is now, as it always has been, a masterpiece. About: In the depths of the Utah desert, long after the Flame Deluge has scoured the earth clean, a monk of the Order of Saint Leibowitz has made a miraculous discovery: holy relics from the life of the great saint himself, including the blessed blueprint, the sacred shopping list, and the hallowed shrine of the Fallout Shelter. About: First published in 1959 to critical acclaim and enduring popularity, a new edition of the landmark novel follows the struggle of the Monks of the Order of Saint Leibowitz to preserve the remnants of civilization after a nuclear war and to protect them against tyranny. from Lippincott Williams & Wilkins (June 1, 1959); titled "Canticle for Leibowitz"
About: Winner of the 1961 Hugo Award for Best Science Fiction Novel One of the most accomplished, powerful, and enduring classics of modern speculative fiction, this is a chilling, provocative look at a postapocalyptic future. from Demco Media (October 1, 1997); titled "Canticle for Leibowitz"
from Demco Media (January 1, 1988); titled "Canticle for Leibowitz"
About: Winner of the 1961 Hugo Award for Best Novel and widely considered one of the most accomplished, powerful, and enduring classics of modern speculative fiction, Walter M.